Our Barn Cameras, Wireless Microphones and Comprehensive Sound Systems, don't COST you money, they MAKE you money by adding tremendous value to your horse operation! At Equine-Audio our mission is to provide our customers with complete –reliable, innovative, and unique - audio solutions for their professional equine facilities, working farms or hobbyist barns from concept planning through completion with a highly skilled professional team. We are the first audio solutions integrator with a primary focus on the equine and farm industries. We boast an expertise in audio with a focused sensitivity for your performance and that of your equine companions. Performance: The ultimate goal is to create an environment that will enhance or improve the quality of your performances and provide clear audio that is critical for your students, pivotal for your audience. A concern stated by many - “our audience can’t hear or doesn’t understand the instructor”… we can fix that. We are committed to creating solutions that nurture your companions’ capacity to perform. Safety: Your safety and that of your partners – and participating guests- are a critical factor in any installation that services a professional facility within the equine industry. You’ve worked hard to perfect your disciplines. Why compromise your safety and performance with a system that does not meet your standards. At Equine-Audio, we have the solution. Endurance: Equine Audio is dedicated to providing high-performance, enduring audio solutions custom designed to your exact needs. Each project is individually crafted using only the highest quality equipment and materials that favor frequent use and that will stand the test of time. Arena/Barn Systems - The Music Never Stops... Unless You Want it To! Thoughtful, intuitive design can mean the difference between sound that is adequate and sound that’s incredibly delightful. 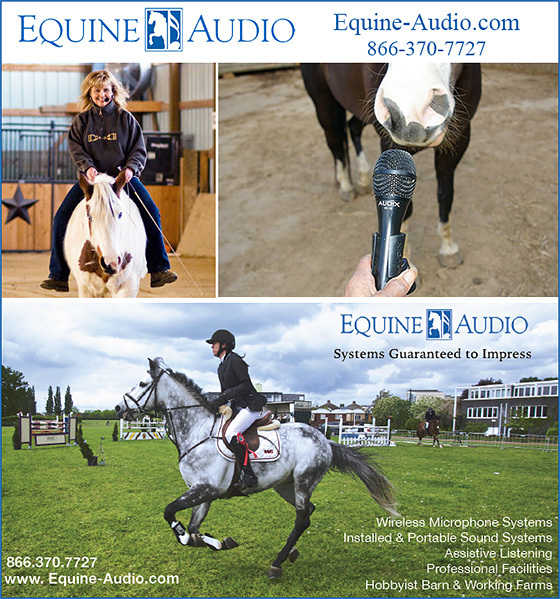 Equine-Audio provides full facility sound systems for dressage musical freestyle, training, clinics, horse shows, large events or simply background music. Wireless microphone applications allowing hands free communication between trainer and students, or instructor to large arena audience are available. Full facility sound systems are highly desirable in professional environments while background music installations in pleasure/hobbyist barns and stables are becoming increasingly popular. Safety is a critical factor when servicing any facility within the equine community, professional or pleasure. We will only specify products that have a proven history of performance. Our robust systems are environmentally friendly, aesthetically pleasing and provide outstanding sonic quality. From the simple to the sublime, our experienced, knowledgeable and friendly team will design a professional sound system that is appropriate for your space and that meets your budget. As a systems integrator we also provide video and remote monitoring (security) solutions. What About Background Music Systems? Equine-Audio offers a variety of background music options that are second to none and that include but are not limited to any combination of -CDs, MP3, iPod, AM/FM, HD-XM. Select one, two or all of the options. Need A Wireless Microphone Systems For Your Next Clinic or Riding Lesson? We've got the best! Our wireless microphone systems provide clear audio that is critical for your students, pivotal for your audience. A concern stated by many - “our audience can’t hear or doesn’t understand the instructor”… we can fix that. Our wireless microphone systems give you the professional edge to make yourself heard. Each system is custom designed, we are able to provide solutions to reach any size audience - from a few students in a small ring or round pen, to a thousand or more in a large arena. We can provide a solution that is the right size for you. We've got it! We can design and install systems for video surveillance and remote monitoring. Got a horse that you want to be able to see anywhere? No problem! We can design and install systems of any size for any application. Security to streaming video, monitoring to mirroring, we can provide a solution that works for you. If you have a live video system setup, people interested in your facility can view this online. Additional benefits include daily procedural monitoring; horse show arena monitoring and remote clinic auditing is possible. Last but not at all least, your ability to monitor a sick or injured horse, priceless! Boarders have the ability to view their horses from anywhere. No worries about what is going on with your horse. We offer many different types of cameras for just about any application! We have cameras for indoors and outdoors, black and white, color, and even night vision - just because a stall is completely dark doesn't mean that you can't still see your horse. You can view your stall anywhere you have an internet connection and a web browser at home, at the office, in your hotel room while you're on the road. Anywhere is possible. Moe and Barb Paulsen have been a joy to work with from the first moment they stepped into my barn. They have become not only business associates but also friends. They exude the spirit of excellence in all they do. When I heard my sound system for the first time I actually cried. It was a 'more than I could ask or think moment'. I never realized that I could have such an amazing sound in my barn. Equine Audio has allowed me to set the atmosphere in a way that I had only dreamed about, not only in the arena, but also in my barn, office, conference room and parking lot. They've partnered with me to create a beautiful experience beginning the moment you arrive at the farm. facility. We have shows almost every weekend from May-Oct and no time to experiment or trouble shoot. Knowing this Equine Audio loaned us a secondary system. At the first day of the show our system worked fine for the first 2 hours of the show, and then went down! In about 5 minutes we had the loaner up and running and the competitors never knew there was and issue. With out this plan and solution we would have no PA for a 4-ring show! Order YOUR Sound System Today! Having the right sound system makes all the difference in the success of your clinics, shows and performances. Our robust systems are environmentally friendly, aesthetically pleasing and provide outstanding sonic quality. Our friendly staff of industry professionals are ready and waiting to design a system that fulfills your needs. We are only limited by your imagination. Give us a call today and we'll get you started!